At the end of 2011 the Blue Rooms were inaugurated at the Uffizi Gallery. They are ten rooms, smaller than the large spaces of the museum. This rooms host works by Spanish, Flemish, Dutch and French painters, who lived between the the Sixteenth and Eighteenth century. Why these spaces are blue? This color was chosen in harmony with the works that it accompanies, with the artistic taste that gave rise to these artworks. Jean Baptiste Siméon Chardin (1699-1779) is one of the French artists in these rooms. He was very famous for his still lives and genre scenes, which are painted with a refined style but at the same time are very realistic. He strongly influenced the painting between the Nineteenth and the Twentieth century, as we can see in the work of Matisse and Cezanne. His works at the Uffizi are the Girl with Racket and Shuttlecock and the Boy playing cards. They are two oils on canvas, which fully represent the painter\'s style. The subjects are presented in a simple composition, but we can admire precious details. The colors are rendered masterfully, as well as the expressions of young people. 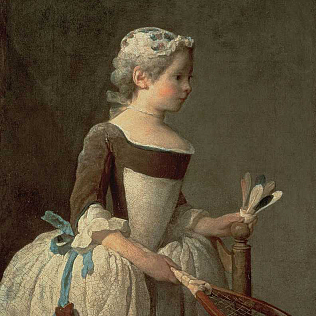 Chardin was probably one of the best painters in the representation of childhood and youth. In the last years of his life, the painter began to lose his sight, but he did not stop to work and experiment with new roads, such as that of pastel colors. Another important Frenchman, Marcel Proust, told about this painter: \"We learned from Chardin that a pear is living as a woman, that an ordinary piece of pottery is beautiful like a precious stone.\"